When you see the Argo Frontier ATV models that you can drive on the trails, take through a lake or stream, and get where you need to go, you’re going to see something that’s different from what you’ve had in the past. 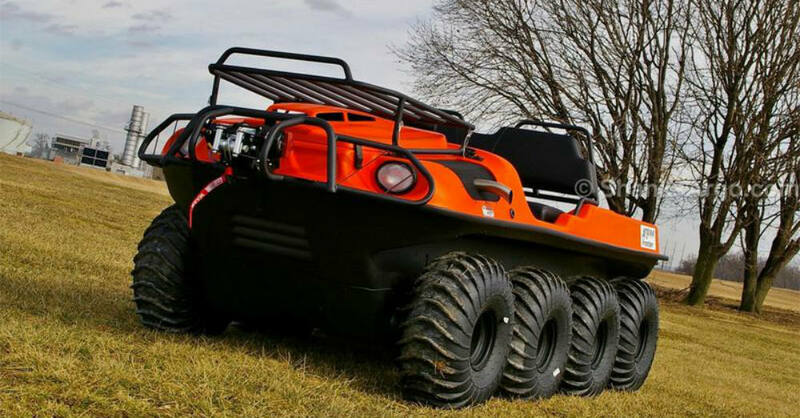 Whether you’re an avid hunter, love to fish in remote locations or simply want to have a vehicle that will enable you to head out in the wilderness to find a fun place to explore, Argo is the name you need to know so that you can enjoy the ride and have the vehicle that can traverse the terrain with ease. The Argo Frontier is offered in either 6×6 or 8×8 models to give you the ride you’re looking for. With either six or eight wheels that are offered with tires that are massive and studded to make sure you can have the ability to get through the wilderness, you want to explore. Imagine strapping your catch on the rack of one of these vehicles to drive it home with you to where you want to go to enjoy showing off what you’ve caught to your friends. Argo makes it easy for you to have the experience you’re looking for. The 6×6 models of the Argo Frontier are the SE and Scout S. Both are powered by a 747 cc Kohler Command Pro engine that provides 23 horsepower for the drive. These vehicles are made to traverse the area with ease at a slow pace to make sure you can have the ride you want and the capabilities you need. The SE uses a classic transmission and can carry 140 pounds in the rear compartment, handle 440 pounds of water, and two up to 1,200 pounds. The Scout S model has either a standard or HT transmission and offers you the same capacity for the ride. Moving to the 8×8 Frontier models from Argo you’ll find the same S and Scout S names being used. These two models also use the same engine with the Scout S pumped up to 26 horsepower to give you a bit more power. Both versions use a classic transmission with either standard or HT capabilities. These models can carry more weight than the smaller models and will seat up to six people while the 6×6 versions of this vehicle can only seat four. Whether you want a capable ATV to take family and friends with you to the wilderness or you’re looking to bring some items back with you from the trails, the Argo Frontier models can help you get the job done. These vehicles are built to go over the rocks, through the streams and rivers you find and make it easy for you to get where you need to go. Visit your nearby Argo dealership today and take a look at what the Argo Frontier has to offer so that you can get things done and enjoy the remote areas around you. How Should You Buy a Used Car?